The election has heightened our awareness that we are seeing the world differently. Many have expressed their shock at how they were blind sighted by the number of people with different views. Just as we can’t see cars that are in our blind spot when driving, we always have a blind spot in our interactions with others. We each have different life experiences that influence how we view the world and make interpretations. A natural tendency when we learn of a different view is to more strongly see how ours is “right”. We naturally give arguments for why others should see what we see so clearly. Give yourself empathy for your emotions and view. 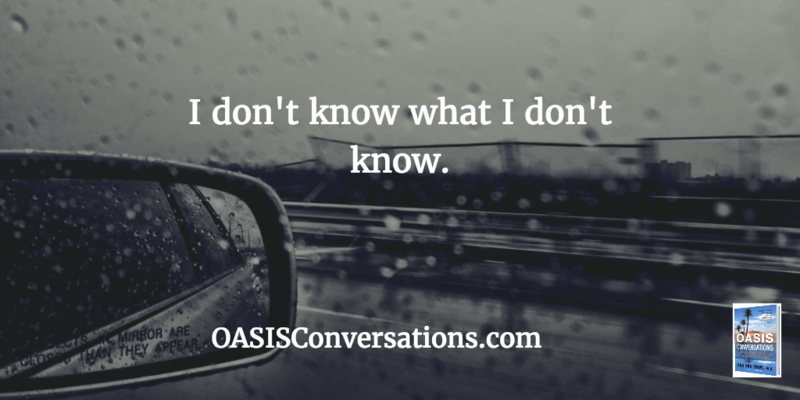 Then say to yourself, “I don’t know what I don’t know.” Acknowledge that you don’t know what is in your blind spot and become curious and open to learning more. We can’t see the whole picture on our own or just with people who agree with us. We need to have open-minded conversations where we learn how others are seeing things. When we seek understanding and acknowledge common ground, amazing things can happen. We often find innovative solutions that were not possible from just one perspective. Look to learn more of other points of view, read and listen to different media and most importantly, engage in conversations with others to learn of different points of view. Be open to seeing new things. This entry was posted in Change, Communication by Ann Van Eron. Bookmark the permalink.